The story of the Golden View rabbit rescue began about 10 years ago. Golden View Elementary School is in southern California. The school had a half acre of land designated as their "farm" where they kept several animals: Sheep, goats, pigs, ducks and chickens, but no rabbits. Over the years, mindless and heartless people started dumping their unwanted and intact rabbits into that fenced-in area. The unaltered rabbits quickly multiplied until, at the time the rescue got involved, it was estimated there were close to 500 rabbits. Because the school didn't bring the rabbits to the farm, they were not considered their responsibility and didn't provide food or medical care. At one point, they even had a predator problem with coyotes killing the rabbits, but nothing was done to stop the killing. The remaining rabbits survived on what the neighbors would throw over the fence. A rabbit lover was taken to the farm to see the rabbits by a friend who lived in the neighborhood bordering the school who thought it was wonderful. 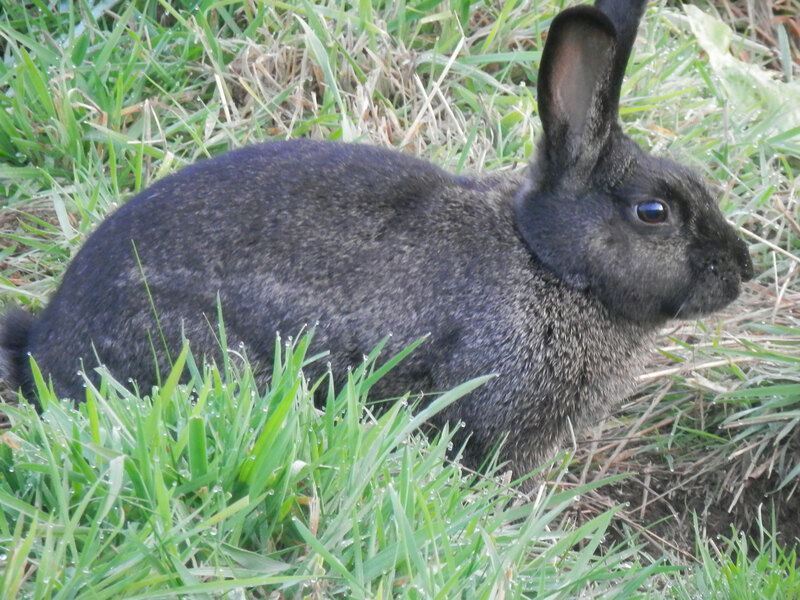 Of course, knowing rabbits, the rabbit lover was horrified and brought the situation to the attention of a small group of her friends who had experience with rabbits. This is when I became involved. At first there was resistance by the school, thinking we would cause trouble, but over time we convinced the school to let us feed them and care for the rabbits needing medical attention. 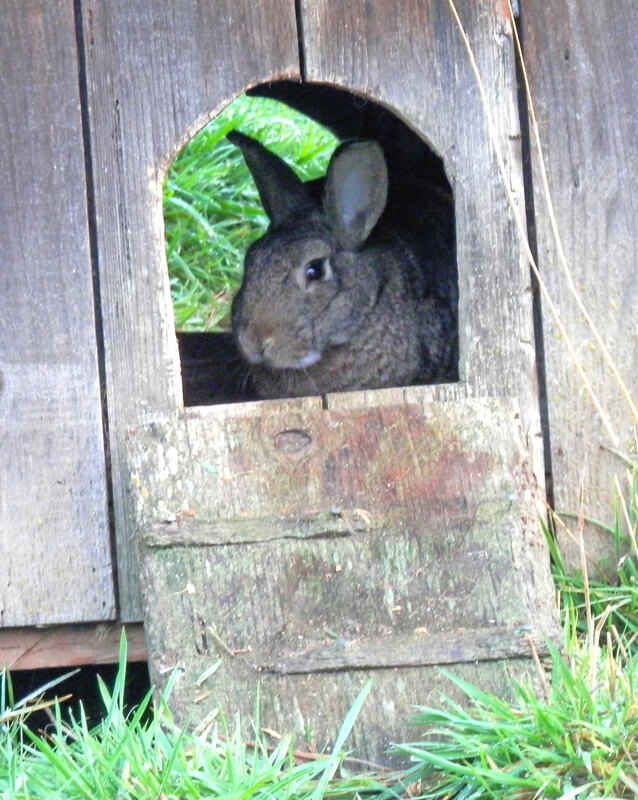 Largely at our expense, we provided hay, pellets and greens, and we took the rabbits to the vet when necessary. After a while, we realized that this was not the answer and would not solve the problem. We started a fund raiser to obtain the money needed to spay, neuter and release the rabbits. We also held adoptions, placed rabbits in sanctuaries and tried to place as many as we could. Through this program, we were able to get 430 rabbits spayed and neutered. The school recently decided they would bring in 4H to run the farm to attract students, but the students were not interested in the rabbits as they wanted designer rabbits that they could breed. At this point, we were not sure what would happen to the remaining rabbits we had been caring for and learned to love so much. Through a small miracle, we learned about Precious Life Animal Sanctuary. After hearing our story, PLAS wanted to help. At the time PLAS learned about the situation our rabbits were living in, we had an estimated 125 rabbits still living at the farm and being cared for by us. When we learned that PLAS would take our rabbits, we started catching and preparing them for travel to Washington. There were 109 rabbits on the first transport to the sanctuary on November 5, 2018. Some rabbits were not able to be caught and others had health issues, so these stragglers will be sent to the sanctuary at a later date. This is the Rescue Express bus that delivered our special tenants. I have always believed that rabbits are magical and have some mystical hold on me, and it's been like that ever since I started rescuing rabbits almost 20 years ago. Simply stated, like all other innocent animals, rabbits ask for nothing and give so much in return. I have been a volunteer at Precious Life Animal Sanctuary for six years. About a year ago, Ralph and Caryl Turner, co-founders of Precious Life Animal Sanctuary, a nonprofit organization, were contacted by Kim Murrell, co-founder and CFO of Save SomeBunny Rabbit Rescue,in a continuing attempt to help find a home for the Golden View 100+ rabbits which Kim knew about but were not a part of the Save SomeBunny organization. (PLAS had previous contact with Kim in November 2016 when they agreed to adopt 28 rabbits from a hoarder situation in Southern California.) Once again, Ralph and Caryl gladly agreed to adopt the Golden View rabbits into their sanctuary, so spaying and neutering of therabbits continued in earnest in the hopes that they would be sent to us by spring or summer of 2018. Unfortunately, during the spring of 2018, to my horror and heartbreak, we began finding mutilated and decapitated rabbits inside the rabbit enclosure at PLAS. All of the much smaller dwarf rabbits simply disappeared. Unfortunately, during the spring of 2018 we discovered a bobcat was getting through the predator proof fencing that protects the rabbits. Ralph determined that the only solution was electrified wiring, and Andrew and Michael Shimer of Electric America, without hesitation, generously volunteered to install hot wiring at no charge. For photos and more about the bobcat see: Caught In the Act – Bobcat Breaks In. With the fencing predator proof once more, we were finally ready to safely receive the Golden View rabbits. In the meantime, the Golden View rescue operation had been very busy, working under a deadline because the rabbit area was marked for being bulldozed for future construction by Thanksgiving of this year. Nonetheless, with untiring determination, nearly all of the rabbits had been spayed and neutered and most of the ill and injured treated back to good health. Those who were not ready for the trip were held back for another delivery at another time. 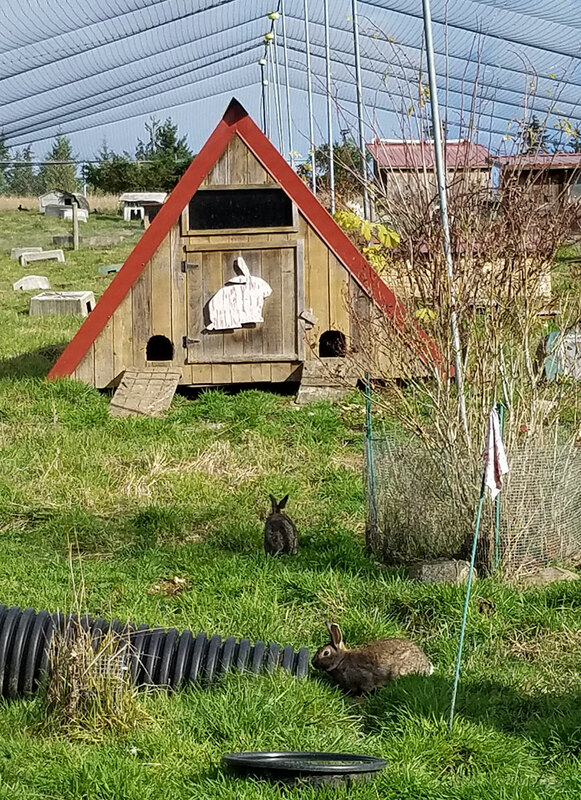 The healthyrabbits were finally ready for transport to Sequim, and PLAS was finally able to safely accept them into their predator-proof enclosure. 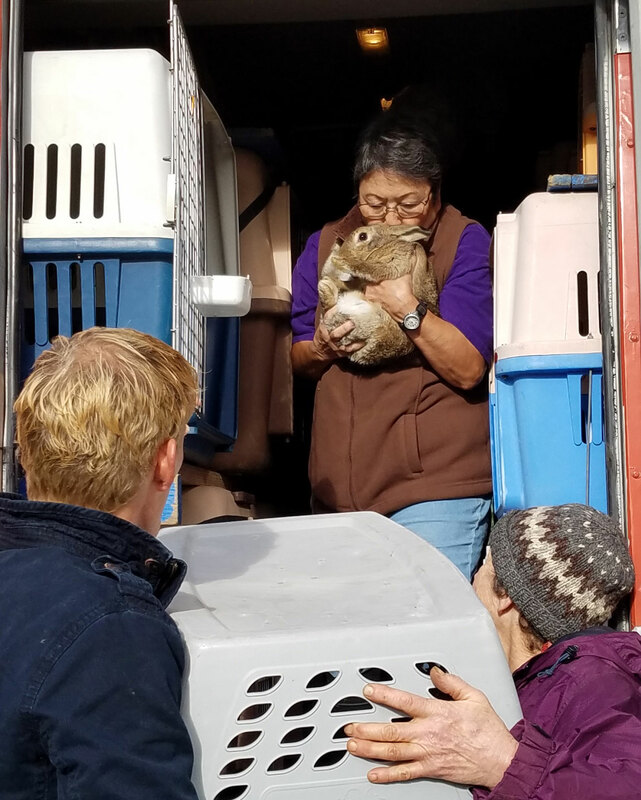 The rabbits left Southern California around 9:00 a.m. on Sunday, November 4, via a chartered transport, Rescue Express, a nonprofit organization, and arrived approximately 26 hours later to the sanctuary in Sequim. There were two drivers, Roger and Omar, who took turns driving nonstop to Sequim. Along the way, they encountered some bad weather which delayed their arrival to PLAS by about two to three hours, but they all finally arrived safely, and the excitement among the volunteers was palpable. The Rescue Express transport drove straight through the pasture gate and parked alongside the rabbit enclosure gate, and this is when the volunteers sprung into action. The rabbits now had to be individually removed from the carriers that were permanently affixed to the inside of the transport into our own carriers that we would load onto the ATV and deliver the rabbits up the incline to the top of the wide-open, half-acre enclosure. 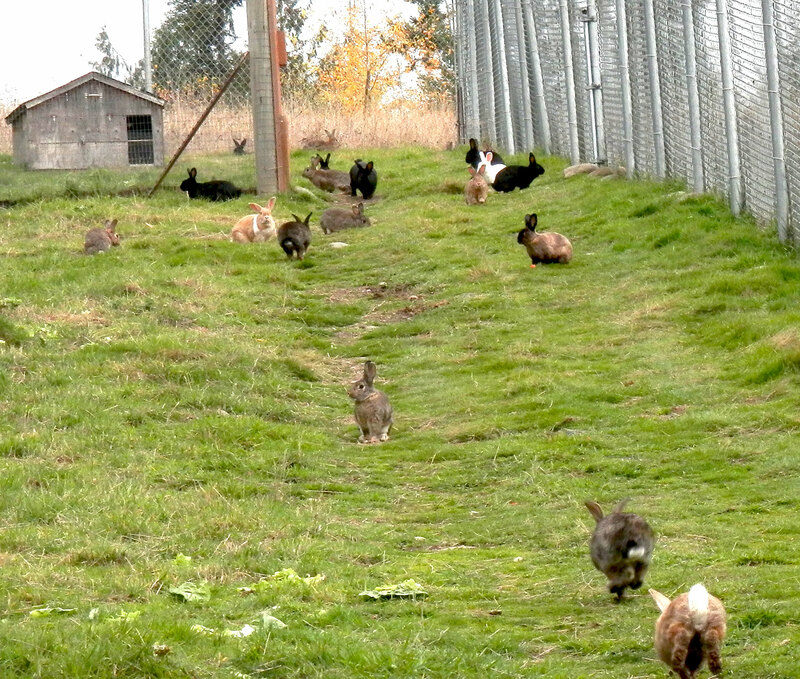 The largest colony of 36 rabbits went first, and we continued this process of removing rabbits by color-coded groups, or warrens, until every single rabbit was released into the grass-covered enclosure. It was so much fun to watch these little angels scamper away from our carriers to run free on grass for the first time in their lives. I knew immediately that this rescue was truly meant to be. The only things that might have delayed and hampered our unloading efforts for a few minutes were several very curious cows who couldn't help themselves and insisted on knowing what all the commotion was about and, in the process, getting in the way. These large nosey neighbors were finally shooed away and our work continued. The whole process took about two hours, and everyone, even Roger and Omar, enjoyed being part of the process and loved seeing the end result of their long grueling journey to understand that they were not just delivering a "bunch of rabbits" to who-knows-where but to see that each individual precious life would experience the joy of being alive and free in our clean, unpolluted air and having sweet green grass under their feet for the first time in their lives. The volunteers who helped us transfer the rabbits out of the transport and into carriers that would finally deliver them to their new home were amazing and dedicated people who wanted to help in this effort, and honestly, we could not have carried out this project at the Sequim end of the trip without them. Roger and Omar were also indispensable in their assistance and willingness to make things run as smoothly as they could as we unloaded 109 terrified rabbits. This was a very rewarding, exciting and, in the end, a fun experience that most of us will never forget. As an aside, a couple of months before the rabbits finally came to Precious Life Animal Sanctuary, I was thrilled to learn that one of my friends and trusted rabbit rescuers from California, Beverly Wallace, was the person who had been in charge of the Golden View rabbit rescue all along. Unbeknownst to me that Beverly was in charge of the Golden View rabbits and unbeknownst to Beverly that I was in charge of the rabbits at PLAS, we made contact with each other again after 10 years. We then both knew that these precious little rabbits had been and will be in good hands. Beverly was greatly relieved to know that after all the time, money, hard work and love she invested in these rabbits and with great trepidation, not knowing what kind of sanctuary these rabbits were coming to, that it was I who would be here to receive her beloved charges. Rabbits are magical, indeed, and I am forever grateful to them for reuniting me with Beverly. There were some rabbits who were not ready to make the journey from California to Washington. You can read about them here: The Final Roundup. For those who are not familiar with rabbits, they are highly territorial and will fight mightily to protect their territory, often resulting in serious injuries to themselves and their foes, sometimes, but rarely, even to the death. Therefore, I checked on the rabbits every single morning for a week after their arrival to make sure that they were sorting themselves out without serious injury. Rabbits are also crepuscular, active at dawn and dusk, so these times are when most of them will be out feeding and scampering about and the best times to check on them. Thanks to the efforts of the Golden View rescue of separating them by warren, this allowed us to release most of them together in groups, and I'm happy to report that they are all doing spectacularly well. Yes, there are many tufts of fur of various colors on the ground, but this is normal and to be expected as they sort out their territories and chase off trespassers. I believe that "Golden View" is the perfect name for these rabbits. It's not a coincidence - just magic. This is the very first batch to feel freedom after a long 24-hour ride. The single most important action you can take to support these rabbits and Precious Life Animal Sanctuary is to share this story with your friends! The volunteers who worked so hard to make this happen today. L-R: Ken Harada, Katherine (Kitty) Enright, Cameron O'Steen, Grace Wright, Polly Thurston and her dog, BlueBird, Cyene Okinczyc, Debra Knutson and Ralph Turner.